"He was part of the furniture," Mathias said. "He was one of us. We're furniture. We live here, on the street, in one of the most dangerous neighborhoods in San Francisco." 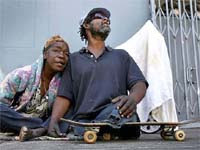 Skateboard, a well-known, homeless San Francisco man, was killed by a truck.